The Guinness Book of Records certifies the rope as the biggest in the world. The Naha Giant Tug-of-War is the world’s largest tug-of-war, properly documented and certified by the Guinness Book of World Records in 1997. 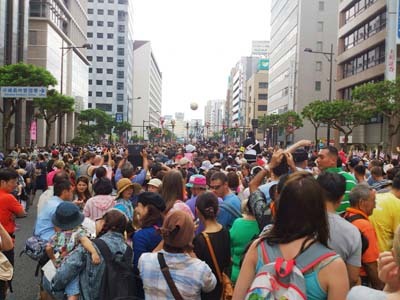 The annual event brings tens of thousands of people to join hands in an attempt to move the 45-ton rope specifically put together for the occasion at Naha Military Port over a period of several weeks before the event. The crowd cheering the contest is estimated at 280,000. A crowd of some 15,000 participants takes either the east or west side to pull the mother of all ropes five meters in either direction during the half-hour competition. Anyone can take part in the pulling contest, but in order to do so, must get there well in advance of the start of the event. About 280,000 people watch and cheer at the event every year. Highway 58 is closed for vehicle traffic from 14:30 through 19:00. 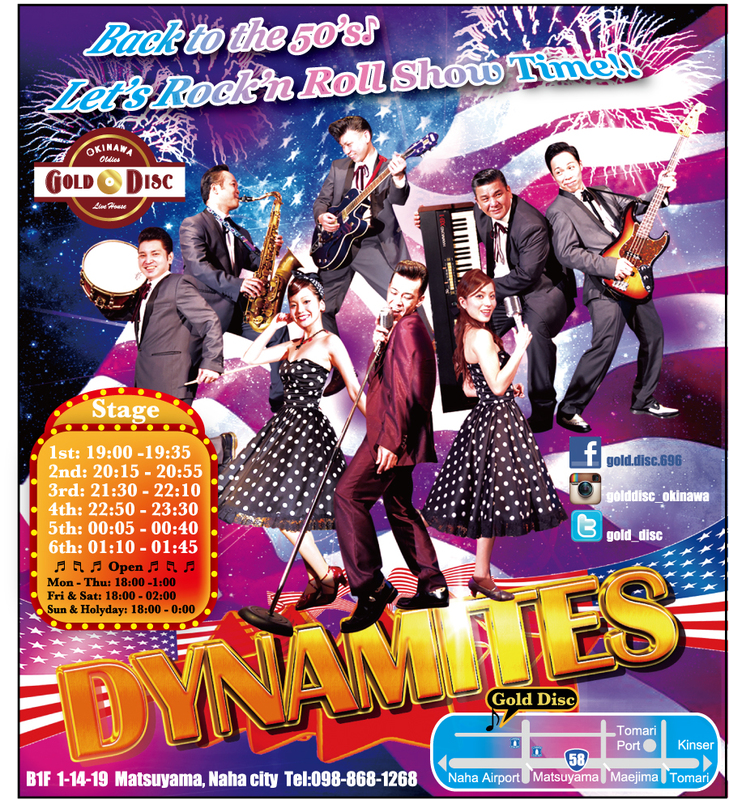 The contest will take place this Sunday on Route 58 at Kumoji Intersection, downtown Naha. The contest begins with a ceremony at 14:45 with representatives of teams from east and west performing a series of martial arts demonstrations and drum performances. 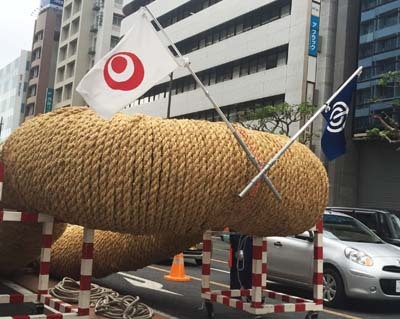 After speeches and praise for the teams of the two sides, the halves of the rope, each about 300 feet long, are pulled together and linked with a 10-foot wooden peg called “Kanuchi” at 15:30. A huge ornamental ball over the rope is opened, and the pulling starts at the sound of a gong at about 16:10. The rope is really massive weighing 40 tons. A new one is made every year. The contest ends with a sound of a siren when either of the sides wins, or no later than at 17:00 if the contest is a draw. During its modern day history, the East team has won 14 contests, West 13 and 15 contests has been declared a draw. 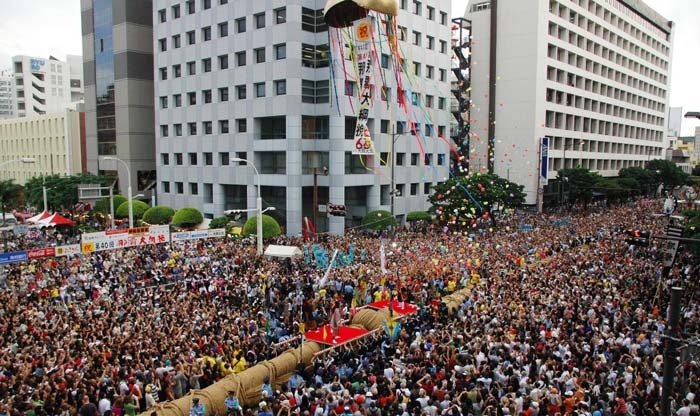 Although the history of the Naha Tug-of-War goes back to the days of the Ryukyu Kingdom, the contest was not held every year, but only during important celebrations. The tradition was broken off in 1935, but was revived again in 1971 to celebrate the 50th anniversary of Naha municipal government, and has been held every year since.